Be the first to hear about their new releases and deals. Download the Booksprout app and search for Melanie Quinlan today! Melanie Quinlan cannot recall a time without books or imaginary playmates. Even though she made some very dear real friends and is at least theoretically grown up, she still loves telling tales and getting to know the many characters that live inside her head. Her fascination with books lead her to studying librarianship, now she gardens for a living and follows a pagan path. She self-identifies as a pansexual, genderqueer female. 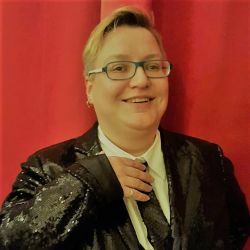 She writes Dark Queer Urban Fantasy and Victorian Murder Mysteries, both featuring Lgbt+ characters. Her is influenced by her love of 80s pop music, everything Victorian, fairy tales, folklore and whatever may hide in the dark shadows under her bed.